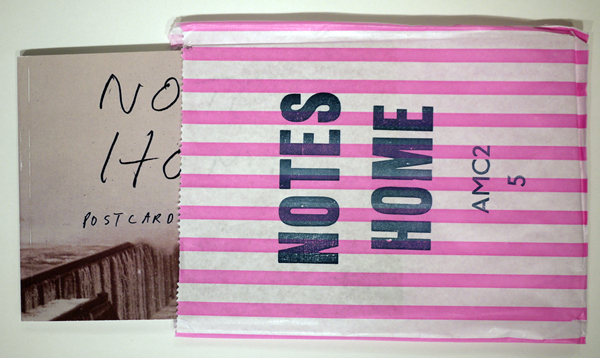 Book Review AMC2 Journal Issue 5: Notes Home Reviewed by Sarah Bradley Notes Home, issue 5 in the Archive of Modern Conflict’s periodical series, brings back warm memories for me. It’s a collection of postcards from the English East Coast, a place I lived with my family for a year as an adolescent; our town, Bridlington, is among the many resort cities pictured. 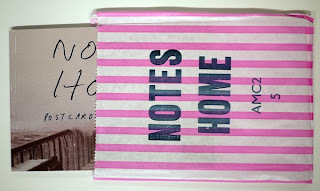 AMC2 Journal Issue 5: Notes Home. Archive of Modern Conflict, 2013. AMC Books, 2013. 60 pp., 30 color illustrations, 8¼x5¾". Notes Home, issue 5 in the Archive of Modern Conflict’s periodical series, brings back warm memories for me. It’s a collection of postcards from the English East Coast, a place I lived with my family for a year as an adolescent; our town, Bridlington, is among the many resort cities pictured. During that time in the early 1990s Bridlington’s history as a fashionable summer resort was long past, though the sandy beaches were still full on sunny days. The beautiful Bridlington Spa that was once a venue to big name acts (I was told on a number of occasions that the Beatles had played there once) seemed mostly unused, and the beachside attractions consisted of little more than donkey rides, a dinky carnival and arcades full of penny games. It was a hard, working class town. I understand why people wanted to take vacations in more exotic and luxurious surroundings, but it was still a lovely place. And at least for a small family of Americans, we found a lot to entertain us. Amc2 Journal. Issue 5, edited by AMC. Published by Archive of Modern Conflict, 2013. Presented in a familiar striped paper bag, the type you’d use to carry away your postcards, the small paperback is perfectly intimate in scale. 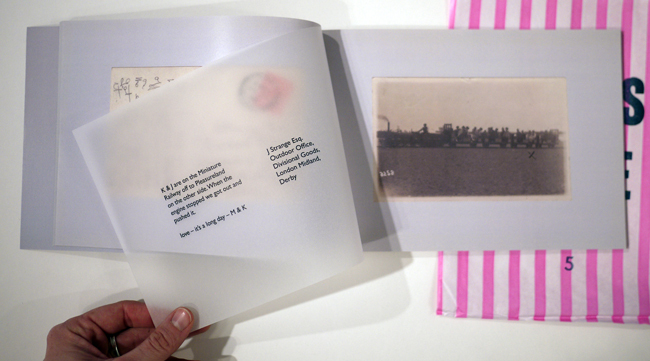 A reproduction of the backside of each postcard rests on the left page, a sheet of vellum separating it from the image on the front. On the vellum, the text from the back of the postcard, address and all, has been carefully reproduced in type, allowing the often hard to decipher inscription to be read. Misspellings and odd punctuation are retained, and no other information is given. The vellum acts as a lovely filter between the front and back of the cards, and when flipped, the text neatly fits into the message and address spaces. During the time that these postcards were sent, these towns provided a well needed respite for the working class – if the addresses of the recipients are any indication, many hadn’t traveled very far to reach their holiday locale. Postcards are an interesting mode of communication – the image on each card is selected to give a certain impression of the place to the recipient, an impression that is then modified by the personal message. There is a wonderful crypticness to the inscriptions. Though we as readers are lacking in critical information to understand the bulk of the discussion, what is missing can be as revealing about the relationship between the writer and the recipient as what is said. Some send their well wishes, others report that fun is being had, and a few announce deaths. One, without address, bears what I assume is a self-portrait, collar up and hat pulled down with a note that says “bit cold.” A few cards present an interesting interaction between the picture on the front and the handwritten message. An image of a group of spectators standing on and around a dead whale on the shore opens with the line “Hope the dog is improving.” A rather uneventful photograph of a hotel in Filey bears a worried and slightly exasperated message that starts with “I hope you are alright” and goes on to instruct the recipient on how to acquire food while the sender is gone. I get the sense that that vacation was sorely needed, though relaxation may have been difficult to attain. The years of the postmarked cards span from the early 1900s to 1983, and in that 80-year gap tastes clearly change. The images on the postcards become less about the seascapes and waterfront promenades and more about resort-like features – ballrooms and hotel exteriors, indoor pools, rides and other colorful manufactured amusements. “Our true intent is all for your delight” reads the neon lights on the wall of a leisure center in Skegness, a photograph from the 1970s that shows not the sea, but wet concrete and a pool. Earlier images focus on the coast, but also the stately infrastructure from which to view it. Some are even hand colored, though carelessly. In one image a colorist has stranded a boy fishing out in the water, though mysteriously he appears to be standing on its surface.